The story goes back some 21 years, to when our Intelligent Solenoid system first hit the market. Before that, off-road travellers were using a manual switch to isolate the auxiliary battery from their vehicle’s cranking battery. Sometime in 1997, we saw an opportunity to automate this process by isolating the two batteries with a heavy-duty, supremely reliable, intelligent solenoid switch. The old faithful Intelligent Solenoid system, 21-years old and still going strong! 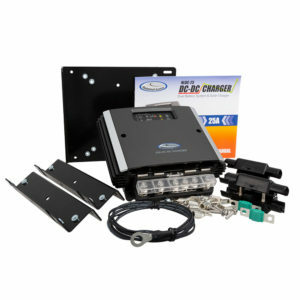 Not to mention it can be up to 5 times cheaper than a DC-DC setup. We were one of the first companies to offer a commercially available dual-battery solution to the global off-road market. For many years we continued to pioneer industry firsts in terms of dual-compartment refrigeration, battery monitors, 12V fluorescent outdoor lighting, and more. However, with the dawn of the electronic age, new technology was rapidly progressing in the fields of LED lighting, blue-tooth fridge controls, and of course, the introduction of the DC-DC dual-battery system. The market’s response to this new technology was startling. 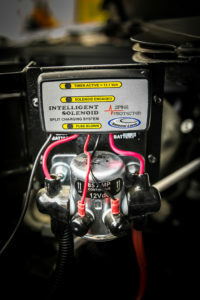 We immediately heard reports of DC-DC superiority, and how much “better” it was than the Old Faithful solenoid switch. However, things were not as they seemed, and it wasn’t long before kinks appeared in the feature-filled armour of many DC-DC systems. For starters, many of them were incredibly heat-sensitive, and once engine-bay temperatures topped 50ºC (a very normal under-bonnet temperature), many DC-DC units shut down. To make matters worse, because most of the DC-DC chargers were 20-25A units, it meant that the majority of them failed to deliver the necessary power when it was most needed: within the first few hours of driving. We were particularly interested to know why so many DC-DC systems weren’t delivering what they promised, so we started comparing various DC-DC chargers against our traditional solenoid setup. Our tests concluded that in certain instances, if the vehicle’s alternator output delivered a constant voltage of 13.9V or more, then the 20-25A DC-DC systems were slowing down the recharge process. In fact, above 13.9V, the solenoid system was radically out-performing any 20-25A DC-DC charger on the market, i.e. within the first few hours of driving. This graph clearly highlights how our Intelligent Solenoid system rapidly outperforms our very own 25A DC-DC setup – within the first 3-hours of driving. You’ll also note, that at this voltage (13.9V), the solenoid system doesn’t quite make it to full capacity (98% charged). However, in saying that, it will also take the DC-DC system more than 5-hours (driving time) to fully recharge the battery. For this reason, we strongly recommend the use of an Intelligent Maintenance Charger no matter which system you install. This graph shows the obvious advantage of a DC-DC system once the alternator’s output is as low as 13.5V. Although the solenoid switch is still outperforming the DC-DC system within the first couple of hours, the bigger issue is that the Intelligent Solenoid noticeably fails to fully recharge the battery, and even after 8-hours, the best it can do is an 86% recharge state. Once you hit the 2-hour mark, the DC-DC system starts to drastically outperform the solenoid system. To further complicate things, our tests showed that the chosen battery type (wet-cell, deep-cycle, AGM and lithium) played a fundamental role on how well the DC-DC system worked. 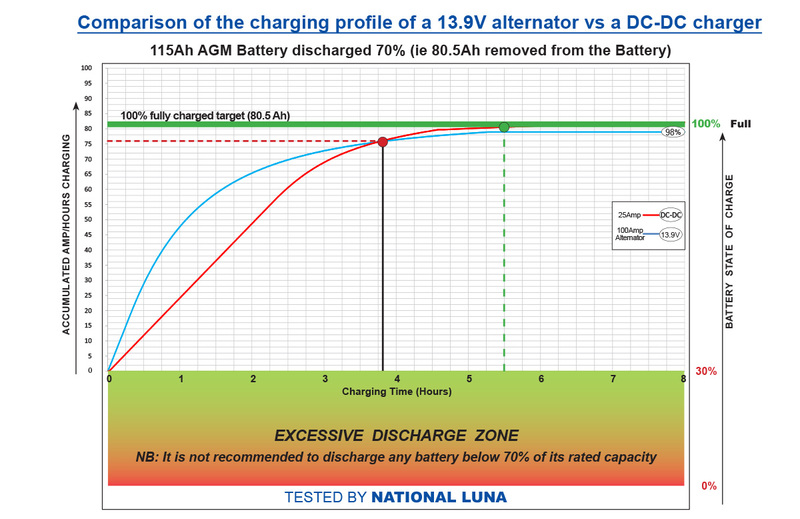 Put another way: If the DC-DC charger was unable to change its charging profile to suit certain auxiliary battery types, it would potentially ruin the auxiliary battery. There was just one problem: without the necessary laboratory equipment to test each battery type, there was no way of analysing the data. And up to this point, our tests had been largely anecdotal, rather than scientific. We turned to battery manufacturers for help, hoping that they would offer some insight into how their products performed under certain charging conditions. However, the response was overwhelmingly vague – either they didn’t have the knowledge, or they weren’t prepared to share it. 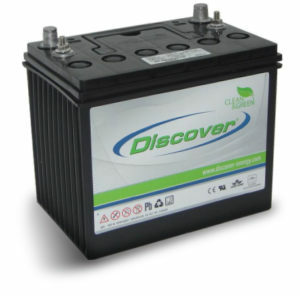 Fortunately, one battery supplier had the confidence to do so: the South African agents for Discover batteries. With the Discover SA folks involved, we invested heavily in highly sophisticated and costly battery-testing equipment. For several years, we discharged, recharged, and analysed reams of data. The results were incredible, and (in some instances) damning of market-leading batteries that crashed and failed to deliver their quoted figures. With the exception of Discover SA, we started to realise why so many battery suppliers and manufacturers were unwilling to divulge their technical data. At roughly the same time, Avis Safari Rentals approached us to equip their fleet of 110 vehicles with 90-litre fridge/freezers. To cut a long story short, the fridges were shutting down within 6 months because of premature battery-failure. Because these vehicles were equipped with the “latest and greatest” 20A DC-DC chargers (coupled to a 105Ah deep-cycle battery), it was believed that the fridges were to blame. Fortunately, our ongoing battery tests had pinpointed the importance of battery type and alternator-charging voltage. 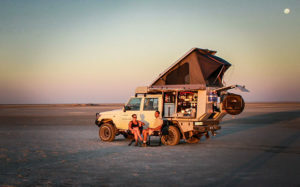 One of many Avis Safari Campers – successfully running a solenoid dual-battery system. After determining that the Avis rental vehicles had all been delivering a constant voltage output above 13.9V, we soon realised that an Intelligent Solenoid (coupled to a 140Ah Discover AGM battery), would immediately offer the best recharge performance, while providing a very cost-effective solution to a fleet-based problem. Because the Avis vehicles had previously been equipped with 20A DC-DC chargers, and because the vehicle’s alternators had been delivering more than 13.9V, it was obvious that the DC-DC system was acting as a power restrictor, and thereby, adding unnecessary driving time to recharge the battery. Of course, a 40A DC-DC charger could paint an entirely different picture, but at nearly 10 times the price, one has to consider economics, too. Nonetheless, the Avis Safari application conclusively proved that even after 21 years of service, the Intelligent Solenoid still has its place in the market, and currently runs (without a hitch), in thousands of safari vehicles across Africa. However, aside from the 13.9V threshold, our tests did highlight a growing need for DC-DC chargers within the modern-vehicle market, and their increasing use of variable voltage alternators. Our tests also picked up some of the inherent weaknesses within many DC-DC chargers, particularly their inability to match the charging profile to a particular auxiliary battery type. 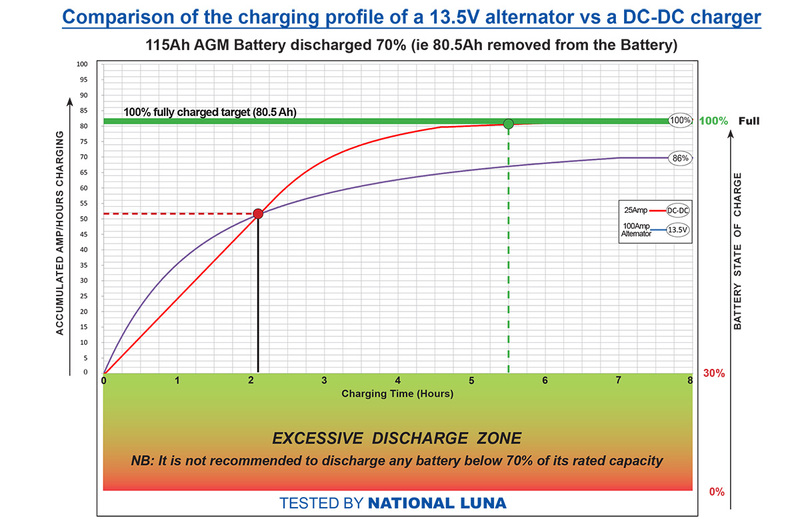 The new National Luna NLDC-25 features a 6-stage charging algorithm, designed to suit four different battery types. 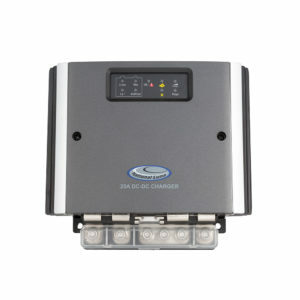 Upon installation, one can select either AGM/Gel, Calcium, Wet-cell, or Lithium-Ion from the various battery options. Once we could conclusively prove all of this, we then started the long process of designing and engineering a truly unique DC-DC system that addressed all of the above-mentioned problems, and more. Today, we offer a host of dual-battery solutions (including DC-DC and solenoid), as an answer to a growing list of applications. But no matter what the future holds for dual-battery power, the important thing to remember is: Just because something is new and more expensive, doesn’t automatically make it better. And that applies to our very own DC-DC system, too. So, be wary of tall-tale marketing and new-technology hype. If your solenoid system is getting the job done, then there’s no good reason to change it. The NLDC-25 features an integrated MPPT solar regulator, as well as the ability to change the DC-DC’s charging profile to match each battery type – including automotive Lithium-Ion batteries. You can also include the NLDC-25 Battery Monitor as an optional extra.